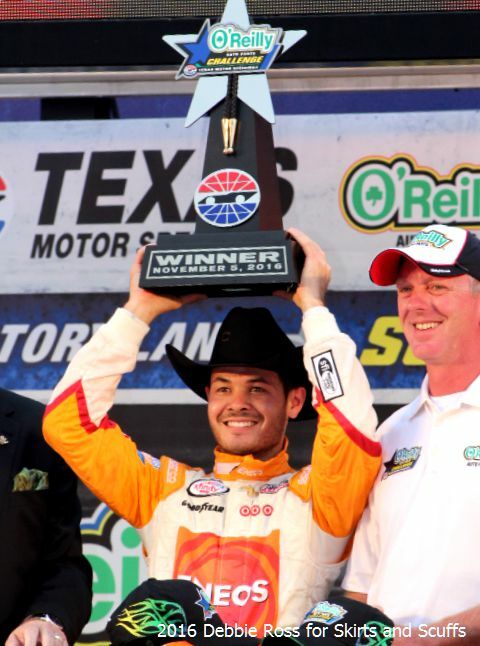 Kyle Larson parked it in Victory Lane at Texas Motor Speedway Saturday afternoon in the Xfinity Series O’Reilly Auto Parts Challenge. Brad Keselowski led the most laps with 122, but Larson took the lead on Lap 171 and used his preferred line to keep Keselowski behind him. At one point Larson brushed the wall, scraping the right side of the ENEOS Chevrolet and rubbing the lettering off his right rear tire. Owen Larson helps his dad apply the winner's sticker in Victory Lane at Texas Motor Speedway, Nov. 5, 2016. Keselowski didn't appear to be particularly frustrated, despite his second-place finish. Third place went to Kevin Harvick, driving for JR Motorsports, while Chaser Erik Jones finished fourth, the highest-finishing rookie. Still, Daniel Suarez heads into Phoenix with the points lead. He had alternator problems early in the race and had to run the majority of the 200 laps with no fans or cooling. 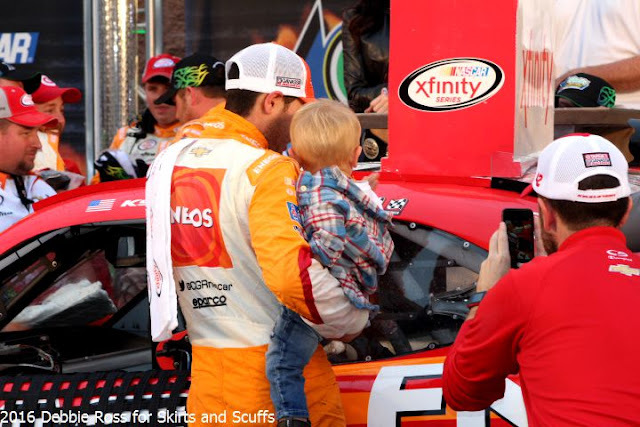 His fifth-place finish put him ahead of Elliott Sadler by a single point. All the other Chase contenders finished in the top 15. Elliott Sadler came home sixth with his JRM teammate Justin Allgaier in 10th. Darrell Wallace Jr. crossed the line 11th, and will need a win in Phoenix to avoid elimination. Ryan Reed, Blake Koch and Brendan Gaughan wound up 12th, 14th and 15th, respectively.